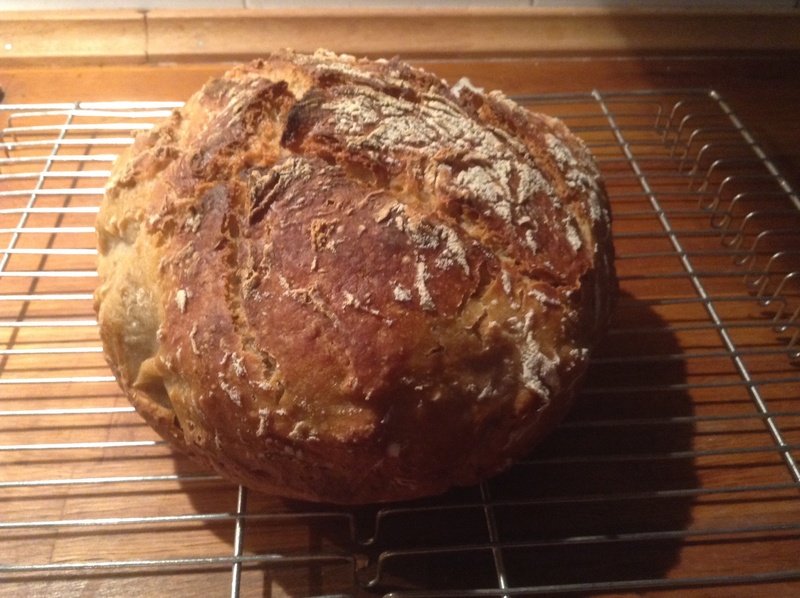 When life is a bit chaotic, baking bread can help. Feed the starter, watch it develop bubbles and the right smell; set the dough, and fold it now and then, and bake it when it suits your schedule. Familiar rituals, which are also soothing. I might have to leave Rome later this year for work reasons, and I find myself alternating between severe apprehension and resigned stoicism when thinking about it. Then I resort to compiling mental lists at 3 AM of hierarchies of kitchen gear: what would absolutely have to be in luggage (sourdough starter, good knives, parmesan), what might go in a limited set of moving boxes (coffee grinder, moka, baking gear), and what we could certainly live without (ramekins, cocktail glasses, fondue set). And just how much parmesan and pecorino would one need to pack? Hard to tell when possible new destination is not yet known. Silly, I know, but it calms me. 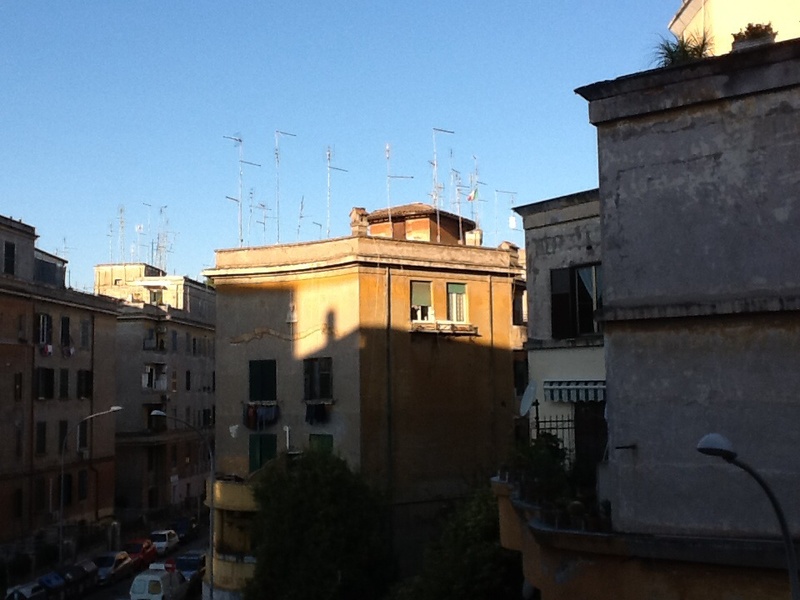 The move might not happen at all, but just contemplating the possibility is making it clear to me that I am really not quite ready to leave Rome yet, despite a number of years here. I have been very fortunate. 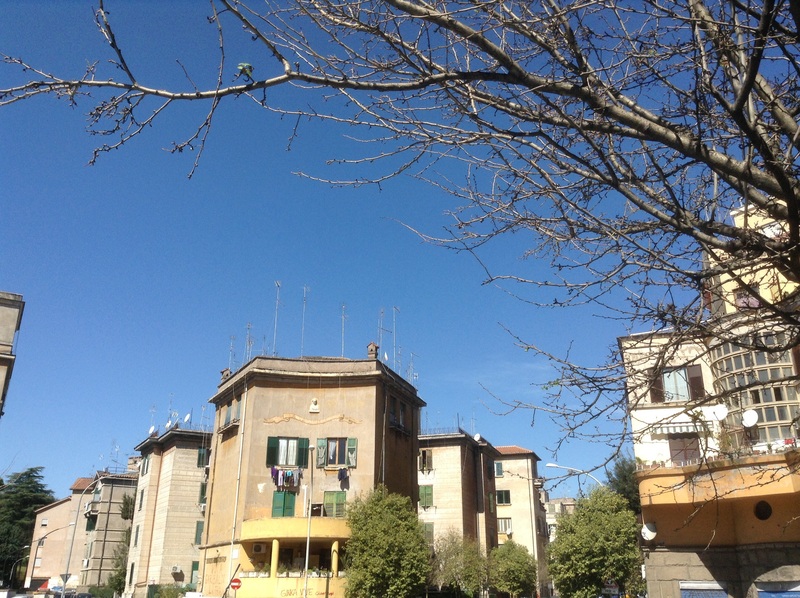 Rome is especially nice now in the spring, so I will just take a deep breath, try not to worry too much over what I cannot control, enjoy the spring and see what happens. Baking bread can be done almost anywhere, I tell myself. 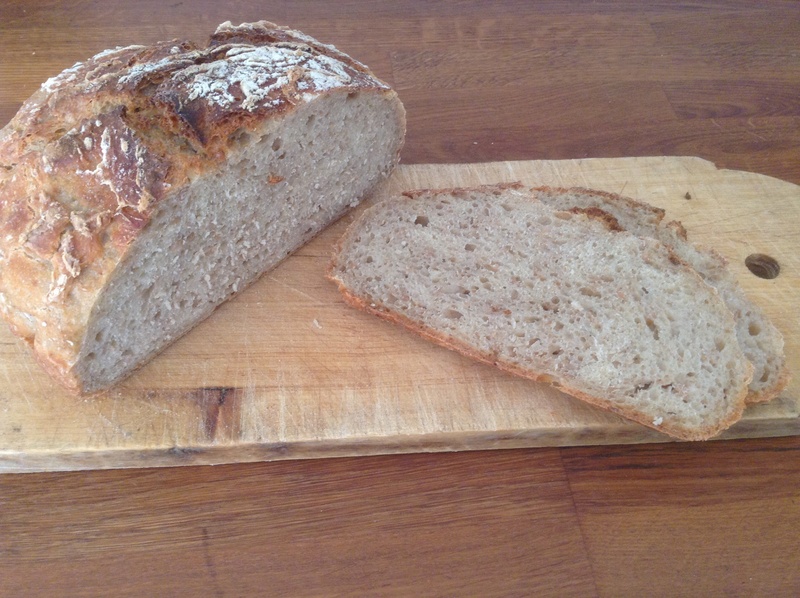 Here is a normal sourdough loaf with buckwheat flour bought in Northern Italy, in Varese. 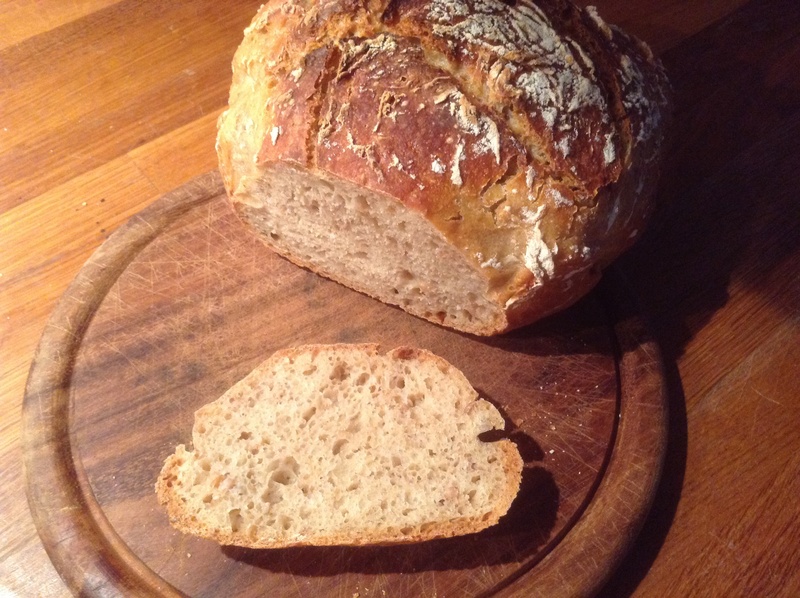 The speckled flour gives a nice chewiness and flavour to the bread, I will try that again. Stir the sourdough starter with the water. Add the flours and mix well. Cover with plastic wrap and let rest for 20 minutes. After this initial rest, add the salt. Fold dough with a spatula. Add more flour or water if you think the dough needs it. This was quite wet. Cover the bowl and let rise for about a couple hours at room temperature. Go for coffee and enjoy a nice spring day first. I just discovered a new lemon tree up the road. Fold the dough a few times (just in the bowl, using a spoon or spatula). You will feel the dough becoming more elastic and responsive, and it will increase nicely in size. For baking same day: move the dough to a floured banneton and cover it with plastic (a hotel shower cap works well), and let it rise three hours at room temperature. I cheat, and line the banneton with baking paper, less pretty markings but easier to lift over to the pot. Our kitchen is already 20C, so this rose quickly. When ready to bake: heat your oven to 250C, with a cast iron pot. When it is properly hot (or after at least 20 minutes), take the pot out carefully. Invert the dough onto a piece of baking paper, slash the dough, and put the bread in the pot. Bake at 250C for thirty minutes with the lid on, then 10-15 minutes more with the lid off, until the bread looks done and the base of the bread sounds hollow if you tap it. About 45 minutes in all, depending on your oven. Cool before slicing. 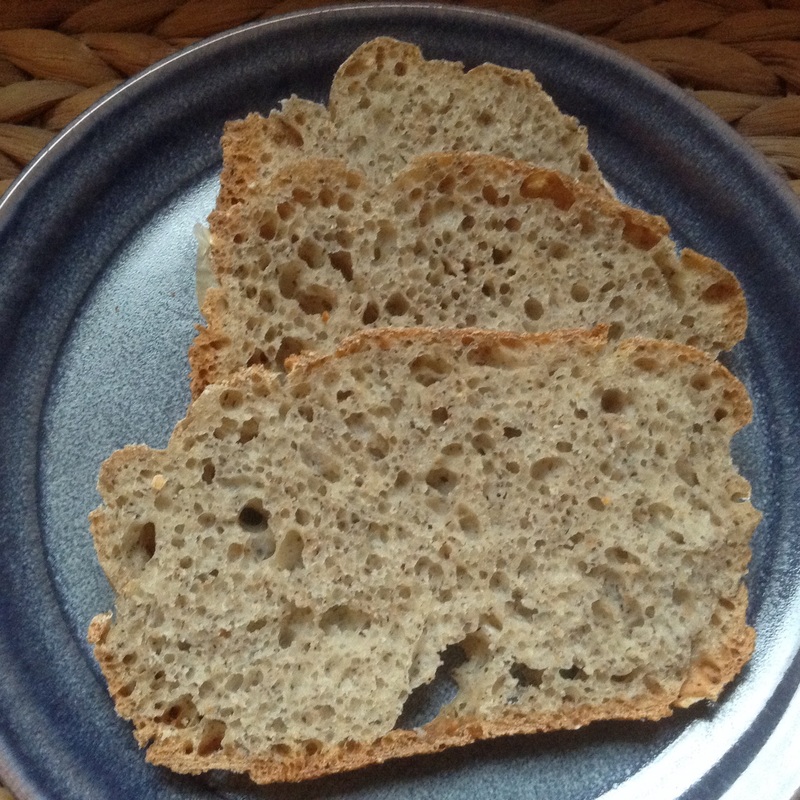 This entry was posted in baking, food and tagged bread, buckwheat, sourdough on April 3, 2015 by krumkaker. Nothing says Christmas like a yucca palm with tinsel! 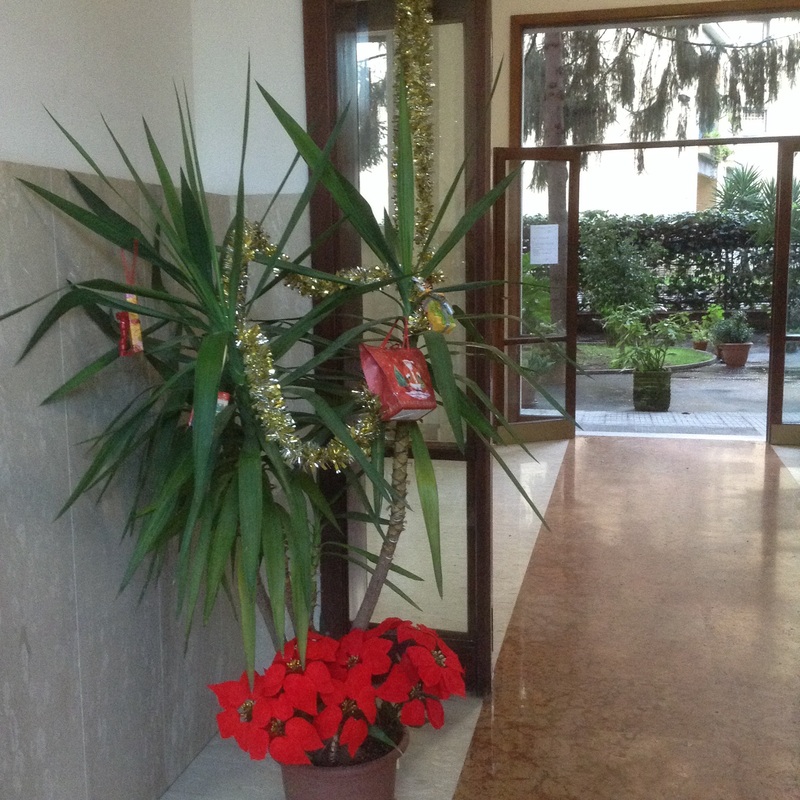 Our palazzo has decorated for the holidays. 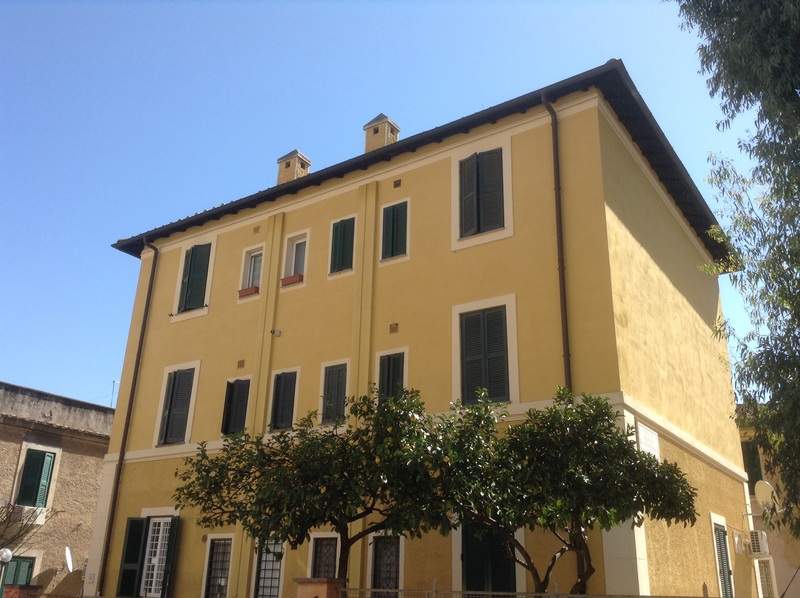 The neighbouring palazzo even has a Christmas tree. 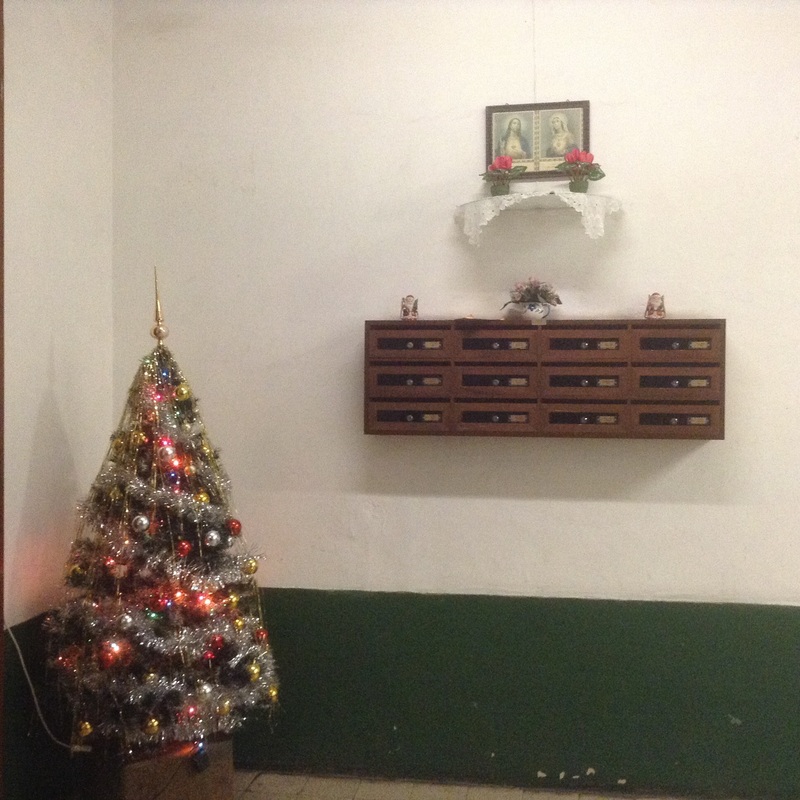 The patron saints live there all year, but have company from a couple Santas this month. Our entrance has the Madonna, as I recall. 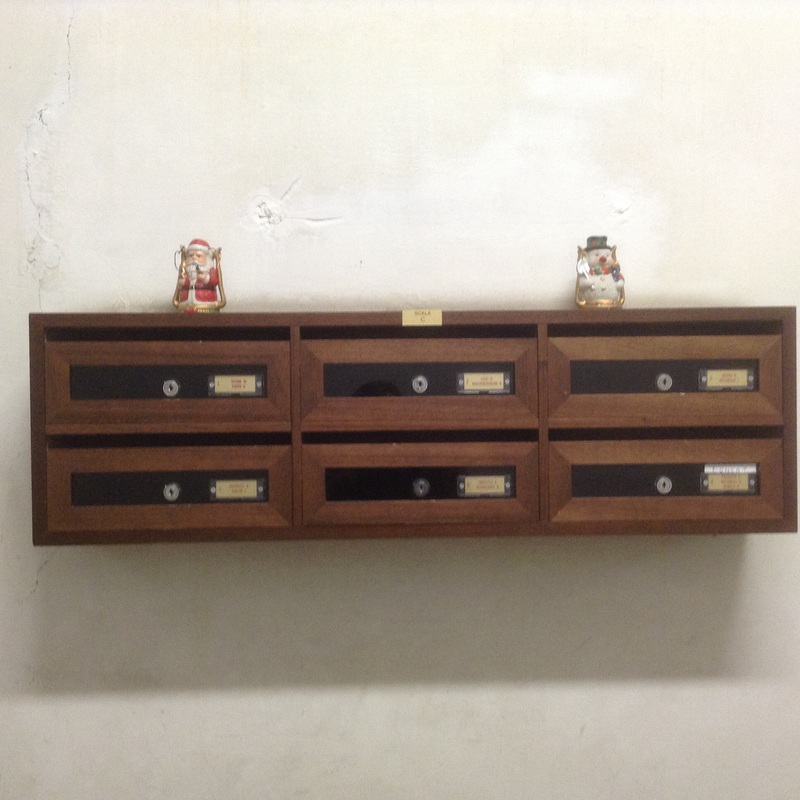 I particularly liked these Christmas figurines on the other mailboxes. Anyway, with holidays imminent a little bread might be nice? I tried adding hazelnuts this time, which worked well. I did this last night at dinner time: Stir the sourdough starter with the water. Add the flours and mix well. Cover with plastic wrap and let rest for 20 minutes. After this initial rest, add the salt. Fold dough with a spatula. Add more flour or water if you think the dough needs it. Cover the bowl and let rise for about a couple hours at room temperature. Fold the dough a few times (just in the bowl, using a spoon or spatula). You will feel the dough becoming more elastic and responsive, and it will increase nicely in size. 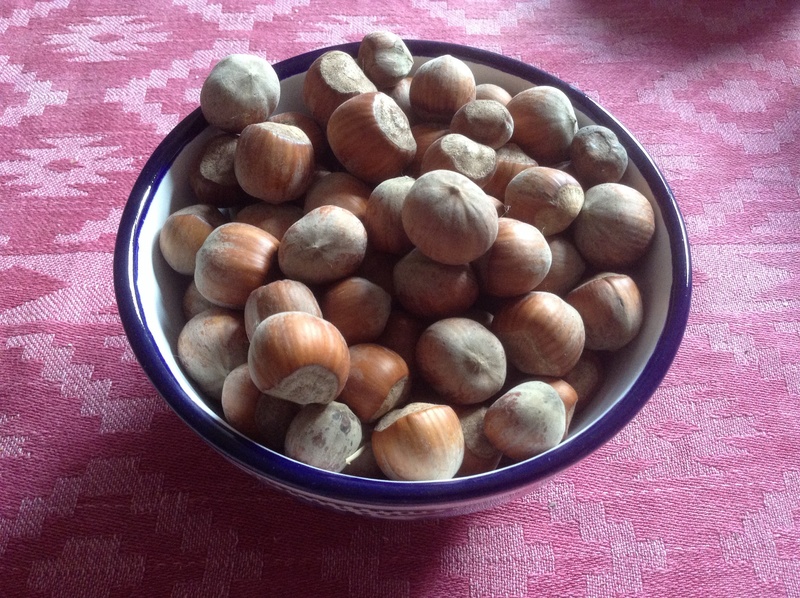 Fold in the shelled hazelnuts during the last fold. For baking same day: move the dough to a floured banneton and cover it with plastic (a hotel shower cap works well), and let it rise 5-6 hours at room temperature. I cheat, and line the banneton with baking paper, less pretty markings but easier to lift over to the pot. I left the dough to rise overnight in the fridge. Depends when you want to eat and have time to bake, I really appreciate how flexible sourdough can be that way. When ready to bake (in my case, this morning): heat your oven to 250C, with a cast iron pot. When it is properly hot (or after at least 20 minutes), take the pot out carefully. Invert the dough onto a piece of baking paper, slash the dough, and put the bread in the pot. Bake at 250C for thirty minutes with the lid on, then 10-15 minutes more with the lid off, until the bread looks done and the base of the bread sounds hollow if you tap it. About 45 minutes in all, depending on your oven. Cool before slicing. 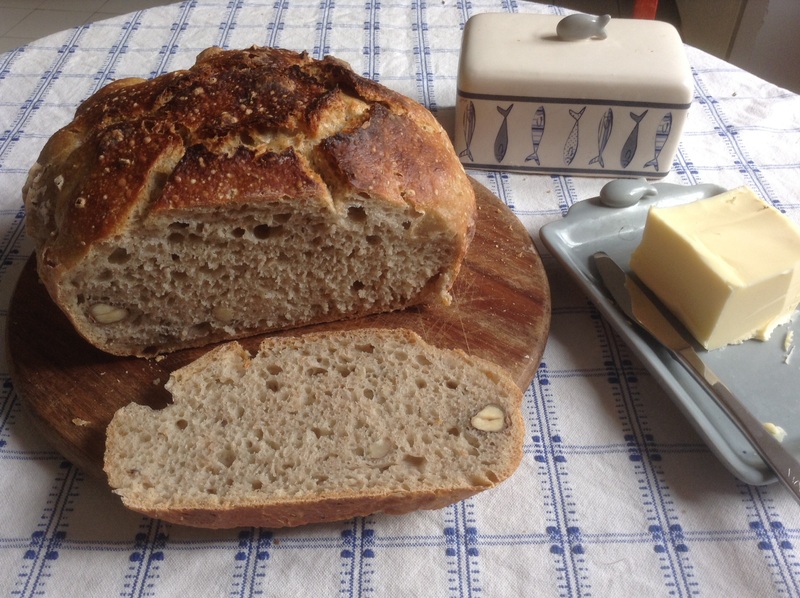 This entry was posted in baking, food and tagged bread, hazelnuts, sourdough on December 24, 2014 by krumkaker.